Yesterday, April 22, 2017, was not only Earth Day but was the date a few thousand people "marched on" Washington, D.C. to protest what they believe is unfair treatment of scientists. Apparently, there is some concern that government funding of certain areas of science is about to be reduced or eliminated. I'm a big fan of science when it is conducted properly, but not a fan at all when false-alarmism is the result. Regular readers of SLB will know that AGW, or anthropomorphic global warming, and CAGW, or catastrophic AGW, is entirely bunk. I have written many thousands of words on the subject. How do we know what is proper science, and what is false-alarmism? That one is quite easy, it is clear by the evidence when compared to the predictions. I can toss a dense ball exactly 32.2 feet up into the air, near the sea shore, and that ball will hit the sand exactly one second after pausing at the peak of the upward travel. The theory of gravity predicts that exact outcome, and the measured data shows that to be true. Every time. False-alarmism is what CAGW scientists are doing, with false statements such as the real data shows real warming. 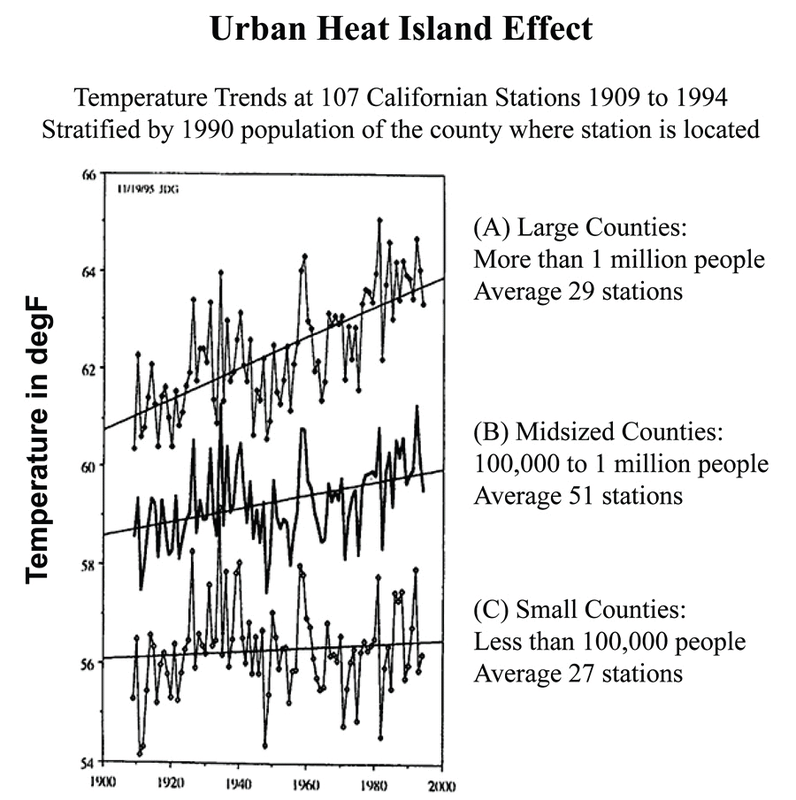 Below is a graph of surface temperatures in California, in the 20th century, segregated by size of population in the county where the measurements were taken. These were taken and published by James Goodridge, retired California State Climatologist. A proper scientist would know that the hypothesis is that man-made CO2 causes global warming over decades and centuries. What is improper is for scientists to lump together all the data, cities and rural, and call that proof that global warming is real. 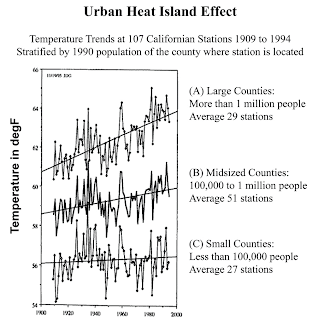 As the Goodridge graph shows, there was no warming for almost the entire century in small counties that had less than 100,000 people in the 1990 US Census (the lower line on the graph). Since proper science is not arbitrary nor is it capricious, it is not possible for CO2 in the atmosphere to selectively warm the cities and ignore the low-population rural areas. Goodridge's findings are borne out in many other states, where large cities (New York City, Boston) show steady and substantial warming, while small towns and rural areas show no warming at all, or a cooling occurred. What is even more instructive is the proximity of a large, warming city to a small, cooling town or village. These are just a sample of the kinds of issues that President Trump and his advisors know to be true, and the basis for reduction or elimination of funding of junk science. I watched the various news and media reports on the scientists' march on Washington and other cities yesterday, and with great amusement. It is actually quite sad to see the tactics now that the false-alarmism is exposed, and the methods are known that produce a trend of warming where none exists. The proper scientific term is proper attribution of causation. Cities are known to warm by many factors, at least ten such factors are written about on SLB. It is quite instructive to note that the false-alarmists refuse to construct a temperature trend that uses only valid data from rural areas. There is no warming. There is also no cause for alarm. There is, though, great need to review federal and state funding of science research and stop the waste of taxpayer dollars on junk science.